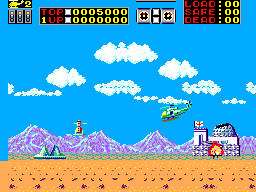 Aside from the usual releases, there is a rerelease form of this game released in the United States (pictured below). It is quite difficult to locate, but easy to spot. "Rescue the hostages from impending death. On land, at sea and from underground caverns." The last eight hostages on level two are in the submarine. Bomb the periscope as it appears from the water. This will cause the entire submarine to emerge. The hostages will appear on the bridge. Land next to them to start the rescue. Move up and down after landing to collect the hostages to prevent the tank from firing. 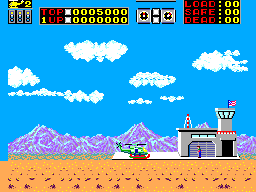 When the helicopter is shot, press both buttons and move the Directional Pad up and down. This will enable the hostages to eject out of the helicopter. On Rounds 1 and 4, shoot 10 Space Mines and Superman will appear. On Round 3, head left all the way to the end of the cave and shoot upwards at the ceiling. This will enable the hostages to run faster. You can do this more than once. On Rounds 2 and 5, shoot the Radio Towers on the boats and Jaws will come out of the water. On Round 4, for every 16 hostages you rescue, with none being killed, E.T. will appear. 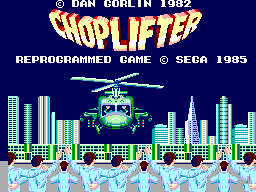 On the opening title screen press the Directional Pad up, down, left, right and then press Button 1. When the second title screen appears press Button 2 You will see the words "Round Select" on the screen. The number will cycle through 1-6 and when desired round is displayed press Button 1 to begin the game. It may take several attempts to get it to work since you have to press the buttons accurately and quickly. On rounds 3 and 6, enter the caves backwards and the fireballs can't kill you.